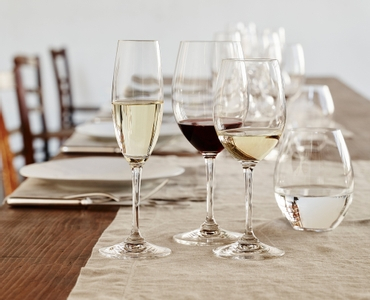 The wine-friendly machine-made red wine glass of the glass collection Degustazione is the perfect starter glassware for restaurateurs on the rise. The shape of the glass helps to release the aromas of the red wines, emphasise fruit and balance tannins. Created with young entrepreneurs in mind, Degustazione is a collection offered at an accessible price for restaurateurs who still wish to serve their customers flavor-maximizing wine friendly glasses. All RIEDEL glasses are dishwasher safe.